Paul Bunyan Alexandra Palace Theatre tickets on sale now! Following a completely sold-out run at Wilton's Music Hall last year, the ENO's hit operetta Paul Bunyan is back in London for a limited five-performance run at the newly refurbished Alexandra Palace Theatre. Armed with a superb cast, magnificent chorus and vibrant energy, Paul Bunyan will be an unforgettable night out on the town. Don't miss it! Is Paul Bunyan a true story? 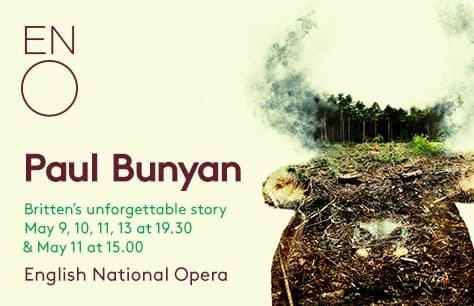 The operetta is based on the mythical giant from American folklore, Paul Bunyan, a lumberjack larger than the average man who led a team of lumbermen to cut down forests and pave the way for civilisation. As for the question of whether Paul Bunyan was based on a real person, many authors of various versions of the tale have professed the tree cutter was real. D. Laurence Rogers drew connections between the 'jolly green giant' and real-life French-Canadian lumberjack Fabian Fournier from the 19th century. The Paul Bunyan operetta was written by English composer Benjamin Britten in the early 1940s to a libretto penned by his American friend, WH Auden. In 1939 during the Second World War and amidst a period of political instability in Great Britain, Britten and his partner, Peter Pears, were left with no choice but to flee to the United States where Paul Bunyan ended up being written. The operetta premiered at Columbia University in 1941 to overwhelmingly negative reviews, after which Britten put it away for decades. Just a year before his death, Britten dusted off his long-forgotten piece, so to speak, and revised it for a new performance, which is now being put on by the English National Opera. Paul Bunyan is directed by Jamie Manton and features designs by 2015 Linbury Prize for Stage Design winner Camilla Clarke, lighting by Marc Rosette, choreography by Jasmine Ricketts, and music conducting by ENO chorus master James Henshaw. Jamie Manton's take on the Britten classic takes a more ecological approach as it explores the wild and unwavering nature of civilisation, the power of dreams and its effects on the world we wish to inhabit. Olivier Award-winning actor Simon Russell Beale is set to reprise his role as the offstage voice for the titular character from the Wilton's Music Hall production. ENO Harewood Artists Rowan Pierce and Elgan Llŷr Thomas are also set to reprise their roles as Tiny and Johnny Inkslinger, alongside the return of the highly praised ENO Chorus, which the critics have called 'terrific' (The Telegraph), 'thrilling' (The Guardian) and demonstrative of 'infallible stagecraft' (The Stage). Paul Bunyan is performed by arrangement with Faber Music Ltd, London. Put on your flannel shirts and be among the first to book tickets to Paul Bunyan at the Alexandra Palace Theatre! With only five performances and a former sold-out run under its belt, Paul Bunyan tickets will not last! Book your tickets now with our safe and secure booking and avoid disappointment!